Kenneth Jeyaretnam is the Secretary-General of the Reform Party. He is also the eldest son of the late JB Jeyaretnam. 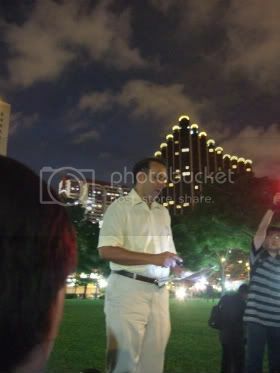 This speech was delivered on 5 Jan 2010 during a JBJ Birthday Memorial held at Speaker’s Corner. January 5th, as you all probably know, was my late father JBJ’s birthday and is therefore a fitting day to pay tribute to a man who played a significant and groundbreaking part in the history of our Nation. Unfortunately for Singaporeans this history is not indelible and in fact his role has already been seriously misrepresented. Within days of his death the government campaign to re-write history went into full swing, commencing with a mealy-mouthed obituary in the ST that gave us a foretaste of the official position to come. This was followed up by an appallingly misjudged letter, supposedly of condolence, by our Prime Minister, who characterised JBJ as “a man out to destroy the PAP and our whole system of government”. This letter, which somehow mysteriously failed to console me, not only assassinated JBJ but also implied that the institutions of the Nation are synonymous with PAP. Conversely to express a contrary view to the PAP must somehow in itself be seditious. Naturally I disagree and refuting the PAP version of history is how I wish to remember JBJ today. His legacy belongs to our Nation and is more important than any one party, creed or cause. I have been accused of engaging in a war of words when it comes to protecting JBJ’s reputation. But after all what is propaganda, censorship and repression if it is not a war of words? In fact what is Parliament if it is not a place for debate? What indeed is a life if it is lacking in engagement? Those of us here who are old enough to remember Anson, to have spent time with JBJ and even witnessed him in action have the necessary tools to protect his legacy. But the youth of this country were not even born when JBJ broke that 14 year period of unbroken one party rule so I am delighted to see so many here today honouring ‘The Old Warrior’. They can play their part by reading his speeches, our constitution and the declaration of independence. The article on TOC today is a good start. Remember that wanting a better country is a deeply patriotic act. It is an act of creation, not one of destruction. In many other countries he would be held up as a hero with statues and foundations in his name. Here in 2008 efforts by some of the civil society activists such as Braema Mathi and Dana Lam to establish a scholarship at NUS or another local university in his memory, came to naught after they were taken aside and discreetly told that, as JBJ was a criminal, no scholarship or chair in his name could be established. This is a perfect example of why we need to remind people that the UK Privy Council, in their judgement restoring him to legal practice, said that his conviction was “a grievous miscarriage of justice”. The Privy Council, while stating they were unable to right this wrong because of a technicality, implied strongly that Singapore should set it aside and reinstate JBJ in his seat in Parliament. Instead, as I’m sure you all know, this current government’s response was to abolish appeals to the Privy Council. Any history of JBJ which does not mention this judgement, such as The Singapore Infopedia entry, is following the state sanctioned line and you should treat it with suspicion. The ultimate aim of this re-writing of history is not to wipe out any traces of JBJ altogether but rather to misrepresent him so he can be used as a Bogey man to frighten you, the people of Singapore, into obedience. May he rest in peace always loved, often challenged but never forgotten! Kenneth Jeyaretnam: Stop re-writing history!